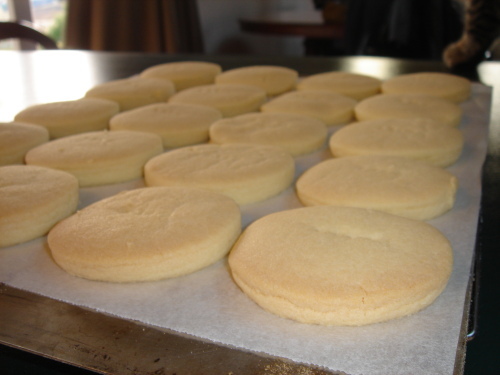 The best shortbread recipe I know is in the Edmonds Cookbook. Cream butter and sugar until light and fluffy. Sift cornflour an flour together. Mix sufted ingredients into creamed mixture. Knead well. On a lightly floured board roll out to 0.5cm thickness. Shape into a circle or cut into pieces. Place on a greased oven tray. Prick with a fork. Bake at 150 deg C for 30 minutes or until pale golden. Makes about 30. Love your typo “sufted! !” very kiwi! We use this recipe at christmas and use a christmas tree cookie cutter – cheap and easy gift – chuck a bunch in a selophane bag – bit of curled ribbon – bob’s your uncle!